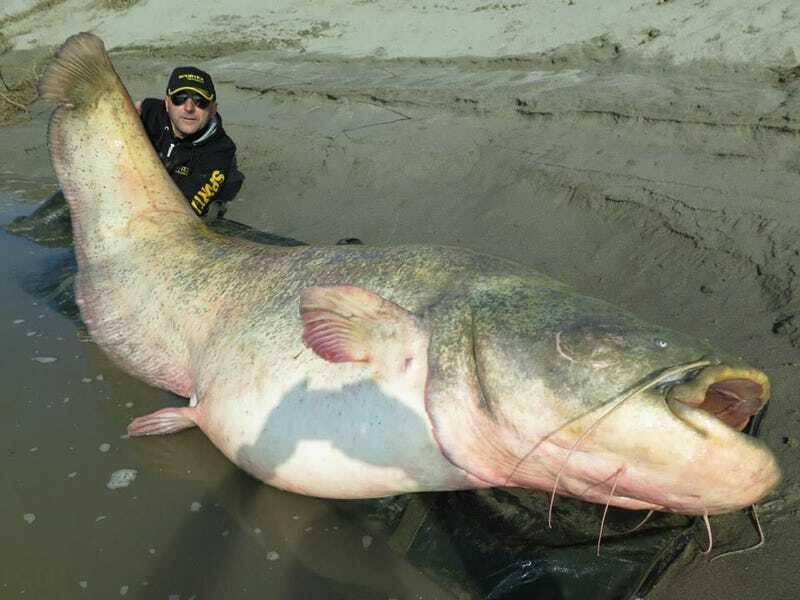 Italian sport fishermen Dino Ferrari and his twin brother Dario lured in this monstrous 280-pound (127-kilogram), 8.75-foot-long (2.67 m) catfish on Thursday in the Po Delta, in Italy. After taking these pictures and weighting what the Italian media calls "The Monster of the Po" they released it back into the river. The brothers used a fishing rod and had to fight for 40 minutes to reel the huge wels catfish in. "The American catfish doesn't grow to such large dimensions – at most it can weigh 50kg." He estimated the fish to be about 30 years old, based on its size, adding that the species can live for up to 50 years. This is not the first time the Ferrari brothers catch an enormous catfish in the Po. This video from 2013 shows them fishing a slightly smaller specimen—or maybe it is the same one but two years younger.